I’m barely afloat in the waters of emotional turmoil. The waves of emotion organically move from despair to hope. I’m not forcing them to do so. On the contrary, it’s as if they can’t help it. As if it’s their natural way. But what is it about me that allows my emotions to flow so fluidly, that does not grab onto any one of them and wrap a story around it to keep it alive and burrow a home inside me? It’s my capacity to witness my self. To step back and allow thoughts and emotions to move through me like clouds move through an open sky. The me who’s watching is different from the me who’s feeling and thinking. Though they both (and more) constitute the tapestry of my unique selfhood, this witness consciousness is integral to my mindful right actions in the world and one of the many benefits of a developed self awareness. Fear. Rage. Distress. Trust. Amazement. Intrigue. As the feelings continue to pulsate like an electrified rainbow I take my seat on my cushion just like I’ve done nearly every day for the last twenty-five years. I bring my emotional state with me, for where else could I leave it? I rest into my breath allowing my post-election anxiety to move through my system with each inhale and exhale—until the energy is spent…run its course for now—and a peace settles in. The peace that holds it all. I don’t “feel” happy or hopeful or even enlightened. I feel undeniably whole and present, accepting of all that has and will move through me…accepting of all that is happening and will happen outside of me. This place of peace is home. 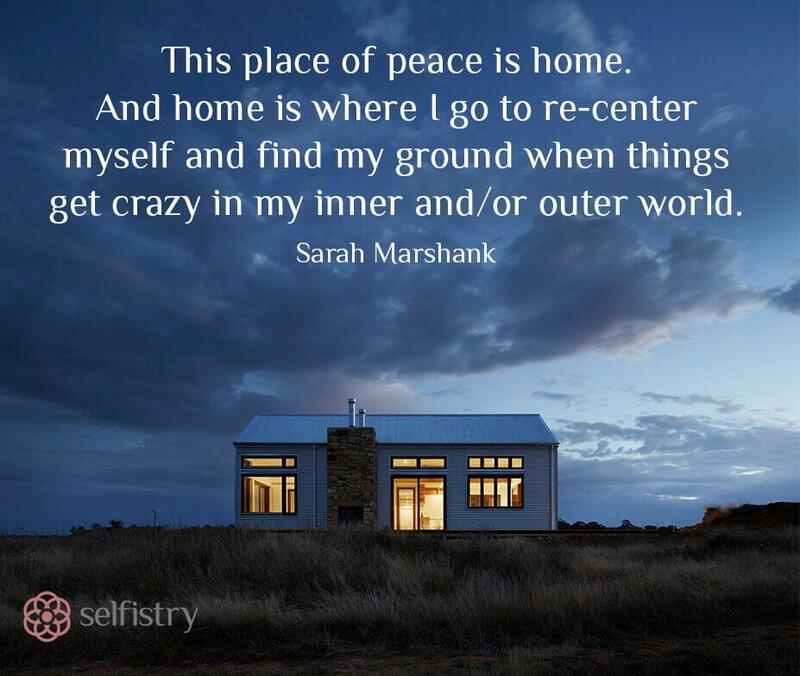 And home is where I go to re-center myself and find my ground when things get crazy in my inner and/or outer world. It was at Esalen this summer when Bernie was forging a channel of change into the collective zeitgeist as a rising liberal anti establishment truth teller sage and savior. I was in the lodge watching one of the primary debates clandestinely, as Esalen doesn’t have a particularly robust wifi stream and prefers that technology remain in the background, if it is present at all. But I couldn’t resist. It felt like too important a time and too important a moment for me to not at least take a peek. While nonchalantly watching my iPhone on my lap with my earbuds in, I noticed the young attractive man at the table next to mine. He was probably in his late twenties with dark hair, brown eyes, three-day-old facial hair, and a mischievous though cautious smile. I caught him watching me and made a casual invitation for him to join which he politely refused. Early the next morning I sat across from him in the hot pool with a small group of people. The conversation meandered its way to politics after some more superficial connecting. The young man remained silent as the talk of Trump began. I could sense under his sunglasses he was avoiding eye contact. So, I leaned in and dared to inquire. “I get the feeling we may not share the same political views,” I offered with a smile. He scanned the crowd as if he wasn’t sure if it was safe to speak his truth. After all, here we were at Esalen, a renowned liberal bastion for self-development seekers, mindfulness aficionados, and social entrepreneurs. There couldn’t possibly be a Trump supporter in these waters. And certainly not a young one! And so he began to speak, sharing his views from the perspective of being an up and coming professional in the banking industry. He talked about how he felt government had leaned too far to the left and the promise of capitalism and hard work was being lost to a sea of amorphous socialism. His views were cogent, his articulation of them intelligent, his passion for a life of economic success solidly intact. I listened. But more, I felt. I felt into his dream for a life or prosperity and family. I felt his yearning for meaning and purpose in a world that seemed like it was losing its way. I felt his desire to be in control of his own destiny, and his own wealth…not necessarily to hold it for himself, but to have sovereignty in deciding how he would spend it and who he would help. Our time was running out and I had a chance for one more question. I smiled at the beautiful young female millennial sitting between us, bright and playful, petite and curvy, deliciously alive. They’d been flirting the whole time and I liked the feel of them together. She an LA socialite, and he, a NY banker. Something about it felt juicy and right. So I took the cue and asked the question that enveloped all of the other questions swirling in my mind. He answered my question without a pause or even a breath as if giving it any further thought might do something to him he did not want to be done. Or undone. “I wish I could be so sure,” I politely replied knowing that, at this point, I could not see. And neither could he. Then I thanked him for being willing to meet me in the inquiry, to have the conversation, to have the opportunity to feel each other’s humanity and to agree to disagree. It all felt so civilized even if I did feel a bit heartbroken by his position. I think of that young man today and all the millions of other Trump supporters out there still celebrating the results of the election while I and millions of Hillary supporters are in shock recovery. I wonder how to move forward from here. How to be here. Now. I hear talk of fascism and recessions, fears of deportation and walls, deep despair over supreme court justices and the denial of climate change. I turn back to my meditation cushion, my gateway to home. My walk in the world—my actions politically, socially, and environmentally—are born from a deep caring heart infused with my love of creativity, connection, and the pure mystery of life. However, for the last twelve years, my sense of self and my choices have been intimately linked to my conscious relationship with my essential nature which I will call divine. Actions rooted in my conscious awareness of the divine have a unique quality of expression. When I’m not in touch with my divine nature, my actions can be greedy, fearful, or based on separateness and a need to secure for me and mine. However, they also can be self-sacrificing, empathetic and expressing care for others. Just because I act selflessly does not mean I am rooted in my divine nature. It may simply mean that I am doing what is asked of me or looking to be loved and accepted. But when I source my actions—my walk in the world—from a genuine connection to my innate divinity I find it yields consistent caring action rooted in that peace I spoke of earlier, regardless of whether my needs are satisfied or not, and regardless of whether my actions are viewed as selfish or selfless. In other words, what if our humanity and our divinity, often viewed as inherently separate or at best, paradoxically linked, became radically interconnected in each one of us? Maybe our actions, informed by our shared essential nature, would sometimes look like giving and other times look like taking but without ever being predictable or determinable from the outside. What if my response to this election and my subsequent encounters with folks who voted differently than I did were directly dependent upon my ability to hold our shared divinity at the center of my being? What if this entire affair of being a good citizen and a just human being is completely an inside job? Then it wouldn’t matter who’s president.